It's yoga. it's circuit training. but we're so much more! Don't take our word for it. Listen to what our Arrichion family has to say. You can hear from people in all walks of life. Different backgrounds and stories but we are all one happy family. Wally Adamchik, a long-time member at Arrichion Raleigh, shares why he loves Arrichion! Arrichion. A small little studio that could. 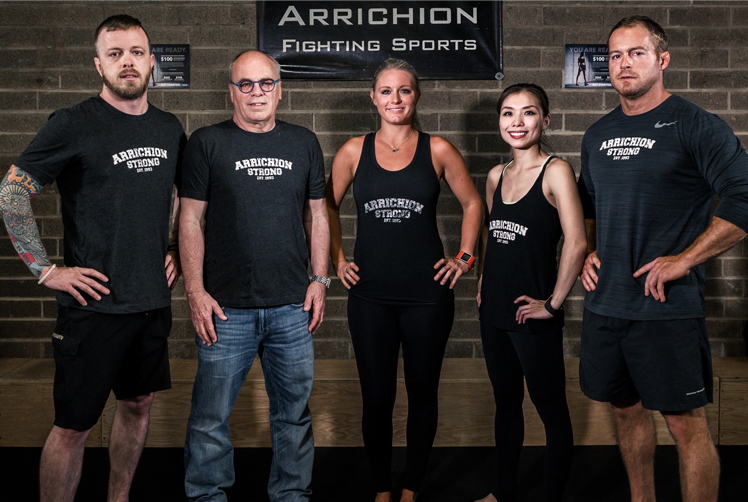 Like many big-name American companies, Arrichion also started in a garage. Learn more about our story and meet the founders. Maybe you've been thinking about going through yoga teacher training. We know there are tons of options out there. But what we offer at Arrichion is more than just sitting around in circles chanting Sanskrit. (We don’t. And if you’re looking for that we’re not your cup of tea). We train you to teach. We prepare you to be business savvy so you can kickstart your own yoga career. Live the life you Love, helping others get fit and be part of a happy #ArrichionFamily. Arrichion is not just about the sweaty workouts. It’s also a place where clients feel at home — where everyone know your name. Own and operate a successful fitness studio using “The Arrichion System”.